Summary: Things are about to get wet and windy. During the day we should see things rather pleasant with our daytime high at a nice 73 degrees. Our winds will be coming out of the east today at 5mph or less. Wednesday during the night is when things start to pick up. Rain chances creep in and go up to about 30%, officially. This likely will take place after midnight and into Thursday. Our low will only fall to 58 degrees. However, the models really don’t depict anything happening at all Wednesday for the Mid State. We will update this post as necessary through the day Wednesday should we see severe weather potential increasing. Thursday and Friday are the headliners this week. 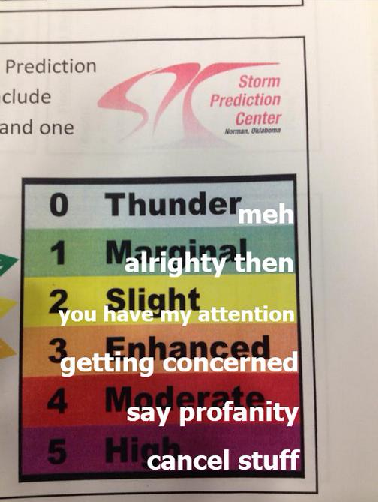 Severe weather potential. We waited until now to post our weather blog so that we could wake up and get a handle on the severe weather potential the next few days. Glad we did, since things always change overnight. As we go from Wednesday night, to Thursday, to Thursday night, our rain chances keep increasing from 30%, to 50%, to 70% respectfully. Thursday will see a 50/50 shot of rain and thunderstorms, while our high continues to climb to 78 degrees. Lots of moisture will be in the air for showers and thunderstorms to work with. SPC has us on the edge of a “Marginal” chance of thunderstorms. Thursday night our rain chances continue to increase as the cold front works closer to us and makes its ETA for Friday. Our low will only fall to a very mild 62 degrees. Friday is the day we are keeping our eyes open for. Strong to severe storms are possible both Thursday and Friday. Here is NWSNashville’s Hazardous Weather Statement. WILL BE GUSTY WINDS AND HAIL. DAMAGING WINDS AND LARGE HAIL. Friday is of particular concern as the front will push through the area the after our high reaches 73 degrees. 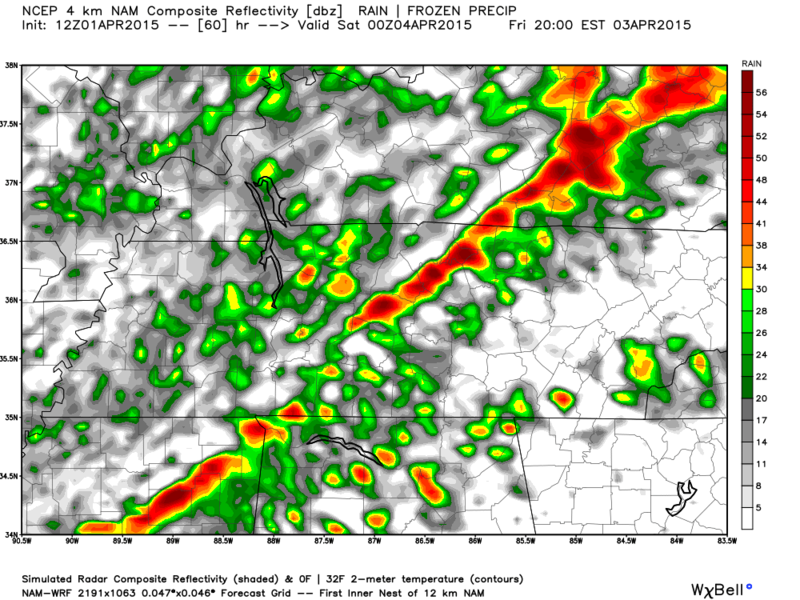 Typically when a cold front pushes through during the spring in Tennessee, storm chances increase. 2-SLGT (yellow) - Slight risk - An area of organized severe storms, which is usually low in coverage with varying levels of intensity. A (better) more human explanation of the categorial outlook comes from our friends at @NashSevereWx (nashvillesevereweather.com) in the form of the graphic above. I may use this over and over when things start to get dicey. 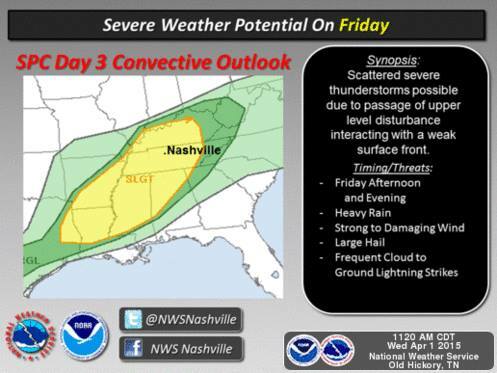 Update 11:30am: Here is a graphic from NWSNashville discussing our severe weather potential for Friday. Update 10:45am: These storms are expected during the afternoon and evening hours on Friday. 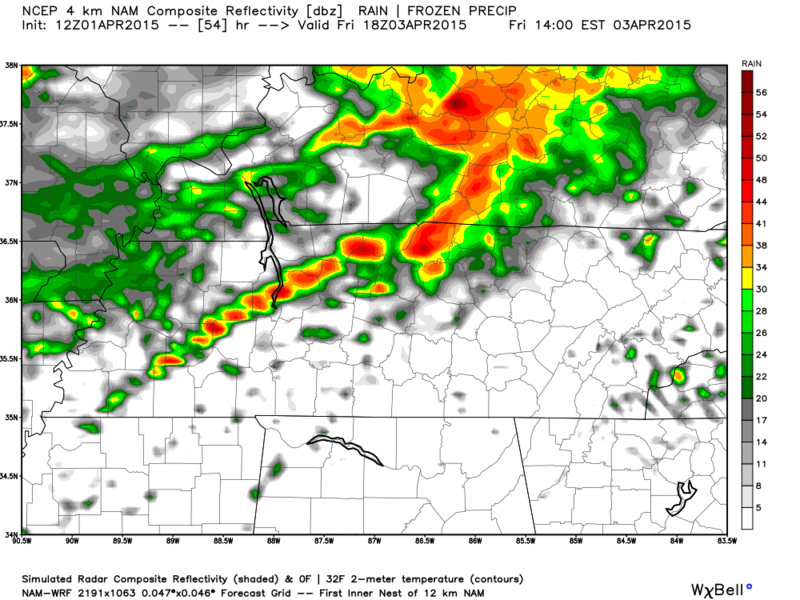 Here is the latest NAM4 model runs for 1pm. And how that same model predicts 4pm. 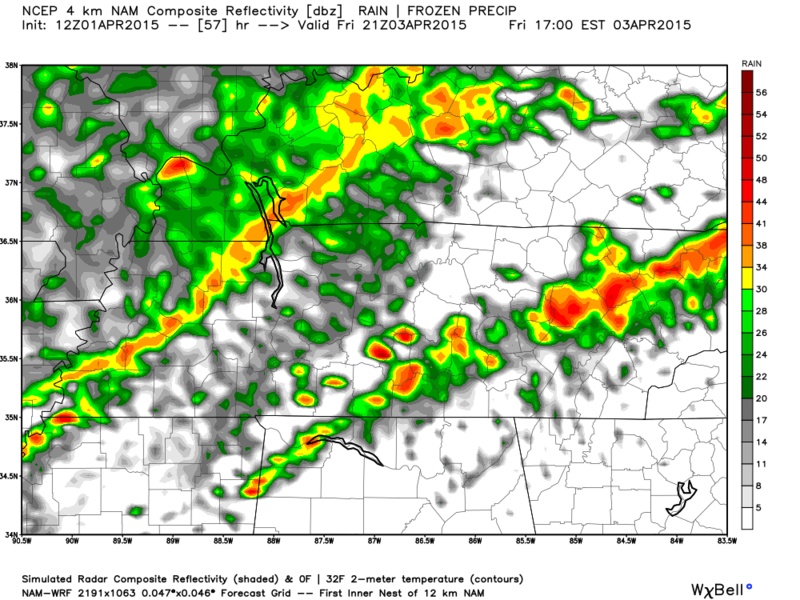 And finally for good measure, how NAM4 is predicting 7pm. So it does indeed look like Friday’s event could come in waves of storms, with the cold front finally pushing through late Friday. If any weather Wednesday-Friday happens to be severe, the main threat will be large hail and damaging winds (and likely lots of lightning). It can never be ruled out, however, for a tornado to occur when a storm system like this develops No ahead of a cold front. All in all we are expected to receive about 1 inch of rain out of this storm system. Spotters are encouraged to report. If you are a trained spotter, you can call the NWSNashville directly. 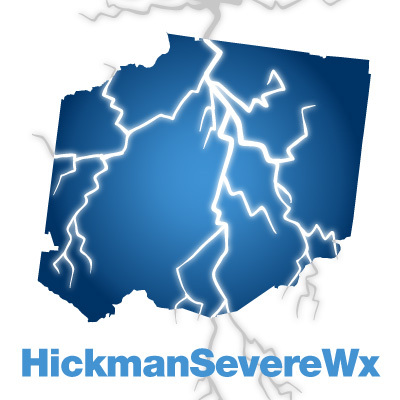 If you aren’t but still feel like you want to report something, you can do so on Twitter using the hashtag #tspotter, as NWSNashville monitors that tag for severe weather. Below is what NWSNashville is looking for. Forecasts change, so we will update this post should we find out something has changed with this week’s weather outlook. Easter still looks good, although the ground will be wet Saturday. 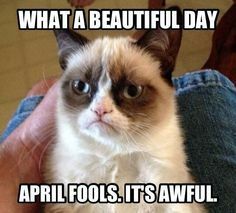 Easter weekend still looks good. However, with all of the rain we are about to get Wednesday-Friday, don’t be surprised if the ground feels mushy under your feet on Saturday. There is a small chance for frost Saturday night/Sunday morning as the low dips.